My, once you miss an issue. Not sure what I’ve missed, but it’s something good. Magus has infiltrated Limbo and all of Magik’s former friends and lackeys have joined dear ‘ol da in the quest to kick the snot out of the New Mutants. The issue opens on Magik weary from defending her domain from entities that are now infected with the Transmode Virus. She’s been infected as well, and a sweep of her soulsword through the leg purges her body of the contagion; additionally, said leg is now covered in silver eldritch armor. Cut to Professor Xavier and the Starjammers bellying up to a bar reminiscent of Mos Eisley. Unfortunately, there aren’t any familiar trilogy denizens BUT we do see the Herculoids milling about. Quite possibly the best pop culture “Easter Egg” I’ve seen so far. The Professor et al are wanted individuals, but they need to get their ship up and running. This seems to be the place. This is also the place for trade of a different kind. On the auction block is a girl who will do anything for you, with the proper training. Unfortunately, it’s Magik. Fortunately, the Professor happens to be there. 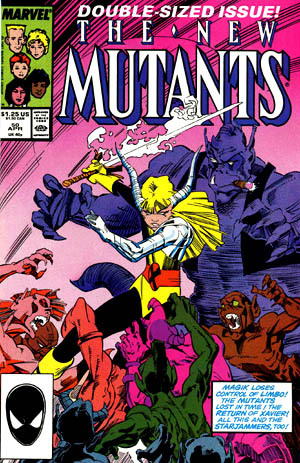 They catch up with the rest of the New Mutants in the future, where there’re some conniving older versions of teammates. Quite the opposite than the future in Days of Future past in issue #48, this is a future where humans are now a sub-species and kept in place much like mutants. Somehow, Magik’s powers are working just when they need them to…and they’re back alongside the Starjammers. Amazing how these things work out sometimes. Magus is on the scene when they get back, however, and there’s hell to pay. How are they going to get out of this one..?